My flight in from Geneva to Palma was also delayed due to weather. It rained in Geneva all day and as we got closer to boarding time, I noticed some flashes of light. Lightning I guessed – but I never heard any thunder. Anyway, everything came to a stop for a short time at the airport. But, within the hour, we were back in business and ready to roll. EasyJet is like Southwest – it’s kind of a free-for-all. No seat assignments. The main thing I noticed though was that the plane was actually clean and reasonably new. I think most of us in the US have just gotten used to the filthy conditions of US carriers like American Airlines – what I typically fly. Maybe this was unusual, but this plane was new and looked clean. Must have been after 9 by the time we got in. Still lots of people and activity at the airport though, including a short wait to pick up a rental car I’d reserved. Hadn’t expected much, but somehow managed a nice little Audi A3. Even in the dark of night, finding my way out of Palma and onto the road to Sóller. wasn’t too bad at all. Google maps to the rescue. Word to the wise (now) though: don’t forget to pick up some Euros at the airport if you’re driving to Sóller. I usually do this as a matter of course, but being completely exhausted from the 3rd leg of the trip and two long layovers, I was making a bee line for the rental car, hotel, shower and bed. It slipped my mind I might actually need some cash right away. But the road to Sóller includes a toll tunnel. The woman in the toll booth knew no English and my explanations didn’t go too far. Thankfully there wasn’t much traffic and I could back out of the toll plaza and make a U turn. There is another way to Sóller: the old mountain road. Had I not been really tired and it not been pitch black out I probably would have liked taking that route but… Anyway, only way in. Back and forth, back and forth… many, many switch-backs later I came out of the hills and made my way into Sóller. The drive was a bit of a white knuckler. Pitch black and mountainous roads I’d never been on – oh, and did I mention I was tired?! Now Sóller is not that big a place and finding the hotel – which is right on the main square next to a big church – should be pretty easy. 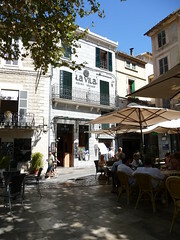 But the roads in Sóller – much like those in other old villages in Europe – are really narrow and one-way. Often you can’t go the direct way and even if you could, if you make one wrong turn, good luck getting back on track. So, I drove around awhile… called the hotel… drove around awhile. Ah, the square! this must be it. I parked illegally and wandered around till I found the place. Then Thomas, the man on duty, came out with me and we drove around some more until we came to the designated parking for the hotel. The ‘little’ Audi A3 didn’t seem so little any more on the streets of Sóller. There were a couple places I didn’t think we’d be able to make the turn – but I managed it. Barely. Finally, unloaded and showered, I slept like a rock. You can see a picture here of the Hotel La Vila. It’s right on the square and there’s always lots of activity right out front. I would guess it has 8 rooms. My room is the one with the window right next to the ‘a’ in La Vila. It’s a clean, comfortable, small room with its own bathroom/shower. Breakfast comes with and I’ve taken it out on back porch of the restaurant in the rear of the building each morning. I like the place.